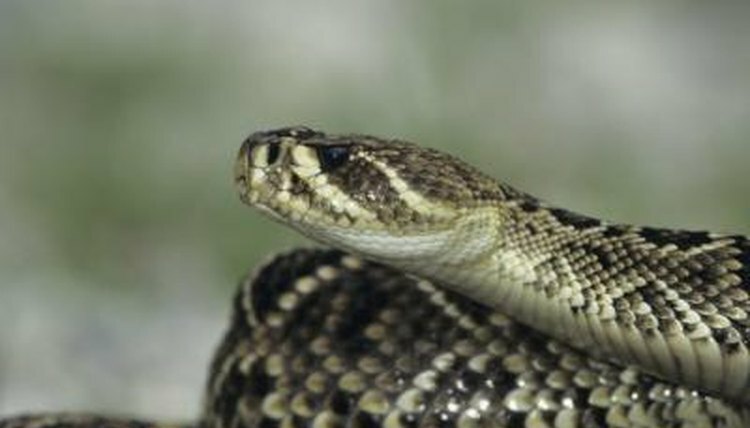 The Eastern diamondback rattlesnake, whose scientific name is Crotalus adamanteus, is the largest species of rattlesnake in the world, reaching lengths of up to 72 inches. This snake also has the distinction of being the most venomous species in North America. Thankfully, these snakes aren't spread very widely throughout the continent, and their limited migration habits mean that you don't need to worry about running into one outside of their native states. The Eastern diamondback is native to the American South along the Atlantic and Gulf Coasts. It can be found as far south as the Florida Keys, extending north up through Florida and into both North Carolina and South Carolina, and also in the southern parts of Georgia, Alabama and Mississippi. It has also been previously seen in Louisiana, but it's believed that this species has been mostly extirpated from (that is, no longer inhabits) that state. Migration habits of the Eastern diamondback are confined to local migration of less than 200km. Other than juvenile dispersal, in which young snakes leave the site of their birth, and short migrations for purposes of breeding, wintering or hibernation, these snakes generally live out their entire lives in the same general area and are considered a nonmigratory species. Mating season for the Eastern diamondback occurs in the late summer and and early autumn months. Males head out to search for mates at around the same time every year. Females don't reach sexual maturity until anywhere from 2 to 6 years of age, and only breed every two to four years. Female diamondbacks apparently ovulate in the late spring and, once impregnated, have a gestation period of six to seven months, usually going to a natal shelter in about the fourth or fifth month of pregnancy. The birthing period for these snakes generally ranges from July to October and peaks in late August. The female Eastern diamondback gives live birth to her young underground. A brood of newborn snakes can range anywhere from four to as many as 32, but the average brood size is about 14 snakes. Newborn snakes measure 12 to 18 inches in length and have fully functional fangs and venom sacs. The mother and her brood remain at the natal site for about a week, until the young snakes first shed their skins. Afterward, the young snakes leave the natal site and disperse, apparently remaining underground for protection from predators for the first year or two of their lives.